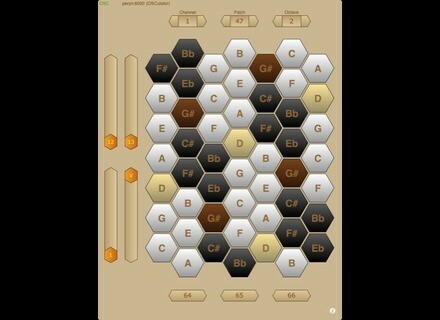 Hexachrom, Other Music Software from SomaScape. 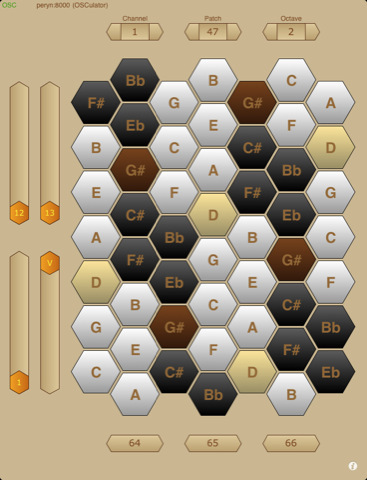 HexaChrom is an OSC controller for the iPad (iOS 3.2 or later), comprising a hexagonal key matrix based on the harmonic table note layout. It sends MIDI note and CC data via OSC over a wireless connection. It provides two views: a single 52-note matrix for easy playability and a twin 52-note matrix with split channel capability. Both views include assignable buttons and sliders (MIDI CC). The note layout allows simple chords to be played with a single finger and, as with any isometric keyboard, chord shapes are consistent irrespective of key.